British ski champion Chemmy Alcott’s obsession with being the best that she could be was unstoppable, even at the age of ten. She managed to convince organisers of a ski camp for teenagers in New Zealand that, although she wasn’t old enough to join up, she was committed to learning and would apply herself to the programme with immense drive - despite being younger than everyone else. They let her in, and thankfully for Chemmy, both of her parents - who had been athletes themselves - were supportive of her dreams. Every year from the age of ten she travelled solo to the other side of the world to be part of the ski camp. It’s a level of independence that you would expect from Chemmy Alcott though. The now-retired alpine skier has accomplished a lot in her 36 years; competing in four Winter Olympics, taking the British Ski Champion title seven times, and becoming the only British female to ever win a World Cup skiing run. She’s broken 49 bones in her body - and told me, in healthHackers episode 31, she’s proud. Even after leaving the sport professionally following Sochi 2014 - she didn’t bother slowing down. Chemmy competed in the World’s Toughest Ski Race in Greenland, cycled a 100-mile road race in London, climbed Mount Kilimanjaro - and became a mother to two little boys; Locki and his baby brother Cooper. “A lot of female athletes, when they retire, they’re searching for an identity,” she told me. “I was Chemmy the ski racer, so to then go, ‘Oh my god, who am I now? It’s really tough mentally to find that identity. 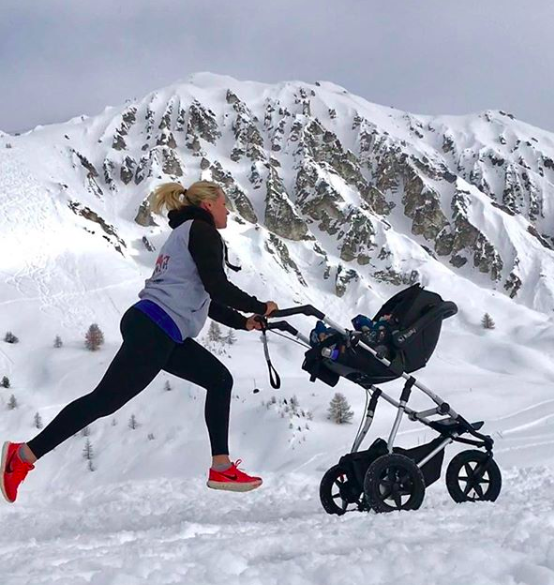 She told me she knew that becoming a mum meant she couldn’t return to being a ski racer “and I needed that,” she said. Physical training was all part and parcel of being an athlete during her career, and it was something she was keen not to relinquish during pregnancy. “You lose control of your body and I’m a control freak. Every day I worked in the gym for a gain, for a goal, then it’s like, ‘Ok, I’m handing my body over to a bigger picture; to create a human being but at the same time I’m still inside, I still need those endorphins - so I kept training,” she told me. Doctors had given her the all-clear to continue doing things like lifting weights or working at altitude but she still felt a lot of negative judgement from other people, particularly when in the gym . “I can’t tell you the amount of times I’d be lifting weights and people would stare at me - not with ‘Wow’ admiration… but disdain. Chemmy encourages all women to get expert guidance on what level of exercise is safe for they, as individuals, to do during pregnancy. She suggests in hindsight that she may have trained too much during her first pregnancy. With Cooper’s pregnancy, she was able to make changes and did more pilates. The wider experience of pregnancy, although not without its low points, brought Chemmy a new appreciation to for her body. “The most confident I’ve ever felt physically wasn’t when I had a six-pack and I was in a bikini and I had all these muscles… it was when I was pregnant. “You realise how amazing you are physically. “That’s the most attractive I have ever felt,” she told me. Away from critics in the gym, Chemmy suffered further emotional blows at the hands of others’ judgements when she went back to work 10 days after giving birth to Locki. Even though she had taken her family on the work trip and was still able to breastfeed regularly - Chemmy found herself wondering if she should turn down jobs because she shouldn’t “be seen to be working” as a new mum. Following a period of self-doubt, she realised how important it is for mothers to believe in themselves and to do what’s right for them and their families - regardless of what other people think. She launched a podcast revealing and discussing the realities of motherhood - the type of podcast she searched for when she was pregnant but couldn’t find. It’s called Motherhood, Mayhem and Madness. Early episodes documented her most emotional moments in the days after giving birth. Chemmy’s mindset of an athlete helped her adjust to parenthood though, comparing any imperfections to losing a race and building on what you’ve learnt. One of her aims now is to post more on social media showing the challenges of being a parent - highlighting the realities of when her little ones are having tantrums, for example - rather than only posting the smiles, because she knows real life as a mum is a process. Subscribe to #healthHackers on YouTube here for more insights from pioneering figures in health and well-being.